Summer is well and truly here in Europe and by the time we get back to Australia later this year we’ll be lucky enough to be heading back into summer! I mean, who doesn’t love an endless summer? We’ve been lucky enough to spend our last two months travelling along the European coastline from Portugal to Croatia and as we head further into summer we’re heading over to Greece and Turkey! We love everything about summer: the sunshine, the hot weather, beautiful turquoise seas, sandy beaches, BBQ’s, sailing, cute summer clothes and so much more! Today we’re sharing our top 10 Summer Travel Essentials that we either rely on or use for enjoyment in summer both at home and whilst travelling! Being an Aussie my top summer essential is of course, a great pair of sunnies! Spring, Summer, Autumn, Winter it doesn’t really matter what season it is because I guarantee you I’ll be wearing sunglasses! A few years living in the UK however meant a lot of rain and dreary, grey days which meant if you wear sunglasses you won’t see a thing and so when Dan and I headed off on our big European summer travels we decided it was time for some new sunglasses as we were about to have over 100 days of sunshine as we travelled though Europe! We found Vision Direct who are an online sunglasses retailer who ship sunglasses all over the world and Dan picked himself out some awesome Maui Jim Sunnies which really suit him and I decided it was time for a change from my usual style and chose Ray Ban Aviators which I love and think are really stylish! Vision Direct shipped our sunglasses to Croatia just in time for our MedSailors sailing trip and if you’ve been following us on Instagram then you will know we had plenty of hot weather and sunshine and were rocking our new sunnies in almost every shot! I bought Dan a GoPro Hero4 last Christmas and I honestly think it’s been the best money we’ve ever spent! Like most people, we gravitate towards islands, beaches and the sea when we go on holidays and I cannot get enough of the sunshine and sea! Previously when we’ve travelled we’ve found it a little tough to completely capture every moment on our DSLR camera as we don’t want to get it wet or sandy and really need to look after it! With a GoPro you can drop it, swim with it, get it dirty, take it on adventures and not have a worry in the world about breaking it! Whilst we’ve still used our DSLR for our travels the last few months we’ve always had our GoPro on us and can’t believe just how amazing it has been. We had some scorching hot weather on our sailing trip and dived in the sea every opportunity we had, always with the GoPro in hand so we didn’t miss a holiday snap (like the picture below)! One of the best accessories we’ve purchased for the GoPro was our float which simply attaches to the GoPro and means it won’t sink when it is in water (it’s cheap and a must if you plan on swimming or diving with your GoPro). Whilst travelling I always pack the basic beauty essentials to keep my skin fresh and well looked after as well as aiming to look half decent in my photos! My travel bag always includes a high SPF suncream, aloe vera (in the case I forget to reapply my suncream), dry shampoo for my hair, BB cream, moisturiser and PawPaw cream for dry lips and everything else that it is amazing for! What beauty essentials are in your travel bag? At home we have a very well equipped picnic set but when we travel we like to pack a basic picnic set which usually includes cutlery, plates and cups. There’s been more times than we can remember that we’ve picked up some goodies and a bottle of wine in the supermarket and had an incredible picnic dinner on the beach, by the lake or even on our hotel balcony. We find that we manage to save money as well as having the best seat in town for views or sunsets which is always an incredible experience. These items take up minimal room in our bags but have been some of our most used items so far! When I travelled through South East Asia a few years ago I packed portable speakers which proved to be one of the best items I’ve ever packed! Unfortunately on this trip our bags were way too full and so we couldn’t fit them in but luckily on our sailing trip a few of our fellow yachters brought theirs with them! Playing summer tunes as we sailed the Adriatic truly made the trip perfect! It was also great when we were having a few drinks each evening after dinner to be able to play music on the boat. Make sure you load up your phone with music and prepare some wicked playlists before you leave home because you can’t always rely on internet when you’re travelling. I love travelling with a sarong as it doubles as a sarong, towel, a shawl if I need to cover my shoulders and even a picnic rug! It takes up such minimal space in my bag compared to a towel and has so many uses! The sarong that I am wearing in the photo below I purchased on Ipanema Beach in Rio de Janeiro and literally travels everywhere with me! On those bright sunny days it is great to be able to take the glare off the water with a polarised lens filter and capture some fantastic photos which will forever serve as an amazing memory from your holiday! Whether you’re into fiction or non-fiction, romance or horror, comedy or travel it is always good to have a great book with you when you are travelling. You never know when you’ll be stuck waiting for a plane, train or bus or find yourself sunbaking on a beach or relaxing on a yacht and we guarantee you that you’ll wish you had a great book! We both love to read and Dan especially has been plowing through books this trip and manages to find great second-hand bookstores with English books whilst we are on the road where he can swap or purchase new books! I always travel with a water bottle because it is so important to stay hydrated, water is my favourite drink and so many countries we’ve visited have drinking water fountains where you can fill up your water bottle! 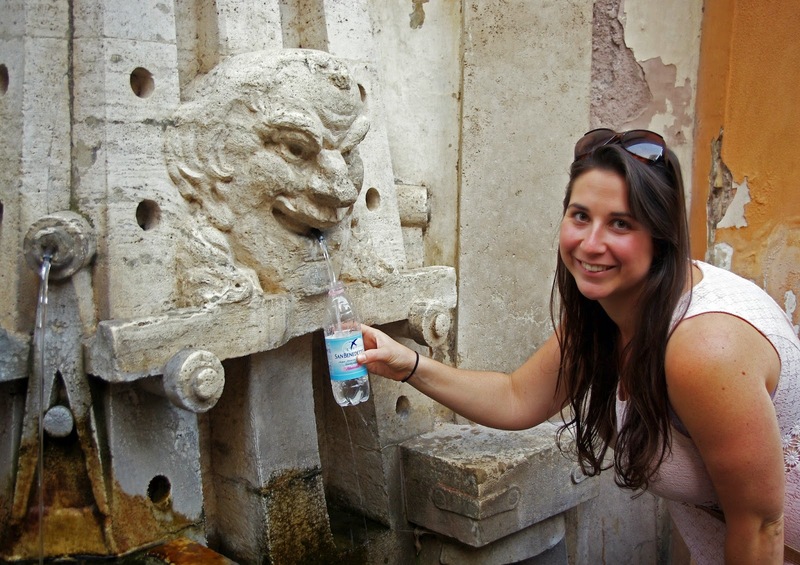 We always research if it is okay to drink the water before we arrive but have found the majority of European countries it is okay and Italy is one of the best – there are literally thousands of fresh water fountains, it is amazing! It’s good to have a reusable water bottle as saves you money, helps save the environment and keeps you hydrated and healthy which is especially important when travelling in the heat of summer! This last one isn’t so much an essential or something you’d travel abroad with but is something that will make your summer awesome and would be fantastic for local holidays! We recently both tried stand up paddleboarding, also known as SUP-ing on our MedSailors sailing trip around Croatia and fell in love with it! Everyone on our boat had a go at SUP-ing during the week and loved it! In addition to being loads of fun, it is also a really good whole body workout! The paddleboards on our sailing boats were also blow up ones which we only discovered at the end of the week which is amazing because we were convinced they were fibreglass! The blow up ones would be cheaper, much easier to store or travel with and also an amazing buy! We’re planning on buying one when we get back to Australia in time for next summer! What are your must-have essentials to make the most of your summer? Let us know if you agree with ours or if there’s any else you’d add to the list! This post is brought to you in collaboration with Vision Direct.